If you need to attach an image to a message that includes PHI or sensitive material, we recommend that you take a photo with DocbookMD itself. 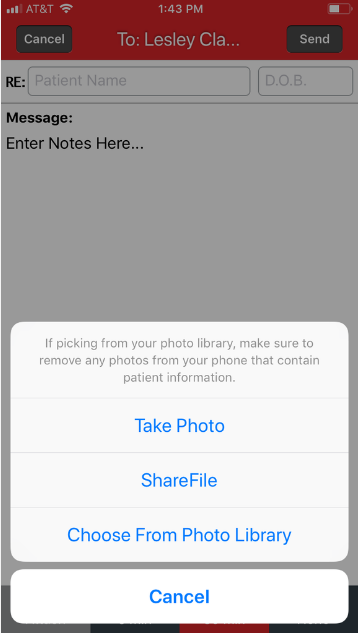 This will ensure that the photo is not saved to your photo library and will help you remain HIPAA-secure. You can attach up to four photos to a message. To attach an image to a DocbookMD message, begin composing your message, choose your recipient, and then choose the attachment icon at the bottom left. You can use the Take Photo option to take a live photo. This will open your device's camera, where you will be able to take your photograph to add to the message. Once you verify your photograph, you can select "Use Photo" and a thumbnail of the photograph will appear on the message. This will not save the image to your device. Lastly, you can import a photo from your Photo Library. On your mobile device, open the PDF and then choose the Share or Export icon. Locate DocbookMD in the list. If you do not see DocbookMD in the Share area, choose the More option, then locate DocbookMD and toggle the switch on, then choose Done. 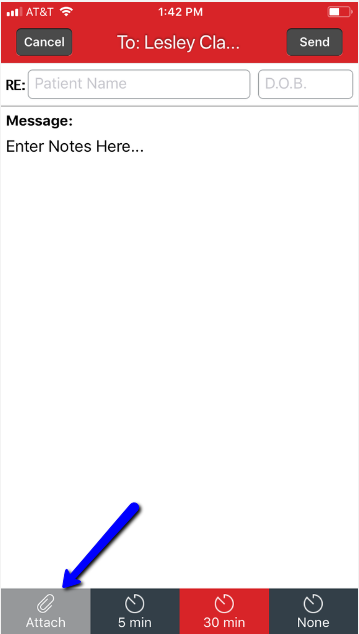 One you choose to share or export to DocbookMD, the app should launch and a new message screen should show. Choose your recipient and write your message to send.